England legend Peter Shilton believes Chelsea defender John Terry should be appointed as Fabio Capello's captain. Capello is yet to name a permanent skipper having tried out Terry, Steven Gerrard, Rio Ferdinand and David Beckham during his time in charge. But Shilton told BBC Sport: "For me it has got to be John Terry, he is the natural leader in the England squad. "Terry is the kind of player you look to in your team for inspiration, he is quite simply a born winner." Shilton, who skippered the national team 15 times in his record 125 caps, says Terry's determination and will to win make him the outstanding candidate. He added: "If you want someone to clear the ball off the line or make a last-ditch tackle or even pop up with a goal, you should look no further than Terry. Do you agree with Shilton that Terry is the best choice for captain? "There are of course other aspects to leading England, but there is no question in my mind where the leadership of that team is - it's Terry. "He has proven himself as England captain before under Steve McClaren and he knows exactly what the job entails, both on and off the pitch. "There is a lot involved with the role but he is definitely cut out for it, I guess it just depends what sort of captain Fabio is after. "He will know as well as anyone that the relationship between a manager and his captain is vitally important." 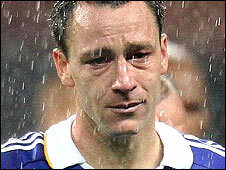 Terry was criticised in some quarters for his tearful end to Chelsea's Champions League final defeat to Manchester United in Moscow in May. Terry had the chance to win the penalty shoot-out for the Blues but slipped on the wet pitch and missed and after United went on to win, he was inconsolable. But Shilton said: "Some people like to see a bit of emotion in their footballers - it never hurt Gazza [Paul Gascoigne] did it? "It was the biggest moment of John's career and he knew it - if you can't cry in that situation, when can you? "I personally wouldn't react that way, but in that instance I definitely wouldn't criticise him, that miss will live with him for the rest of his career." Earlier on in his career Terry was involved in high-profile incidents off the pitch, being fined by Chelsea for a drinking binge in a hotel in 2001 and then cleared by a court of affray a year later. Capello has underlined the importance of his England players behaving themselves on and off the pitch, but Shilton does not believe that should mean Terry misses out on the captain's armband. "Every England captain in the past has gone through times when things have happened off the pitch, whether they are true or not," said Shilton, speaking at an event organised by England team sponsors Nationwide. "Look at Bobby Moore, the greatest skipper England have ever had - he was put through the injustice of being accused of stealing a bracelet in 1970, which we all knew was not true. "The odd story can appear in the press and you have to take it with a pinch of salt, it happens to everyone - even John Terry."